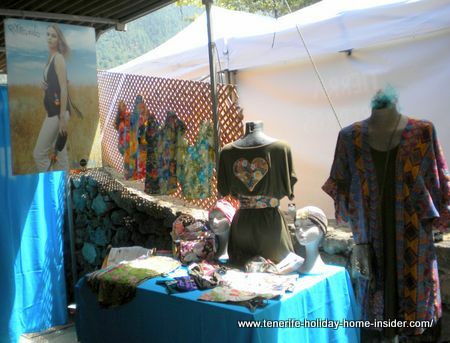 Go forSpanish fashion to stock up the wardrobe in your holiday home in Tenerife. There is no point to bring along clothes from overseas when you have your own property. Purchase it in many of the places which find mentioned below. 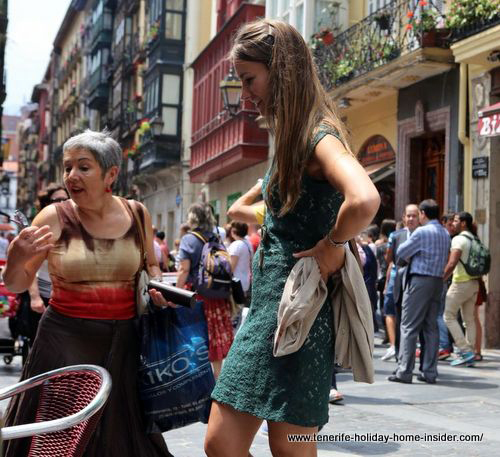 The Spanish way of dressing is vibrant, flattering and innovative. It is more and more in the limelight of international media. 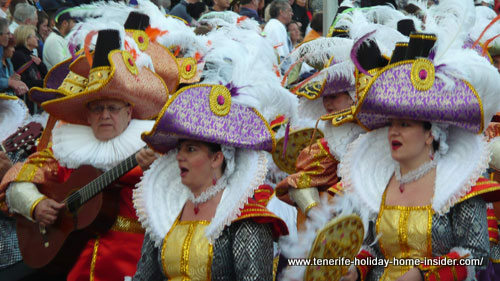 Did you know that there are fashion shows at night at every local Fiesta in Tenerife. The funky La Longuera popular suburb of Los Realejos has them. There is so much more to it than Spanish Haute Couture of fashion designers like Paco Rabanne, Christóbal Balenciaga and others which were loved so much beside Spanish Ibiza fashion by the Duchesse of Alba. Desigual which is an eccentric Spanish pret a porter clothes style that originates from Ibiza is a new comer in the Latin fashion world. It's a typical example for vibrant, colorful patterns. Fashion by Mango in Canary patios. The creations by Mango also have their strong colors but have more conservative designs compared to Desigual. On the other hand, the Andalucian flamboyant Flamenco dress with its unique dance shoes will never disappear from Spain's traditions. Think of the captivating styles of music and dances which were copied by all Royal houses of Europe during the last centuries. Needless to say is that Spanish Royal attire was imitated too. The Toledo jewelry fashion which dates back to such times gone by has just been beaten among other by a new Spanish jewelry designer who has taken over hotels with his ideas. Spanish casual wear autumn 2016 at Tenerife La Longuera. 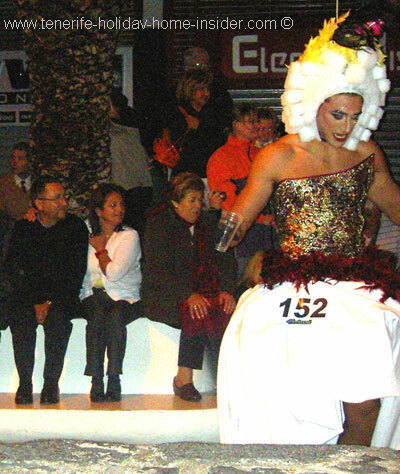 Autumn street festival fashion shows, as shown above, have grown successfully over many years at Toscal Longuera of Tenerife. Inditex, Zara, Strativarius and fashion faux pas? Nevertheless off lately, I was wondering, why the shopping mall Centro Comercial CC Hotel Mirador del Duque doesn't have one typical Spanish fashion shop by the world known Spanish House of Inditex. After all, Inditex which represents the biggest global fashion groups went a very long way since it has opened its first Zara shop for Spanish street fashion in 1975. 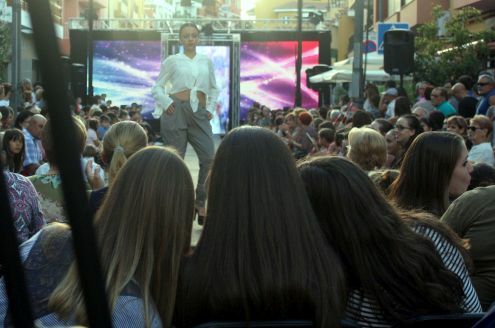 Please note in the context of street fashion Stradivarius that San Christóbal de la Laguna, the main Tenerife student town is inviting its people to come forward wearing Stradivarius clothes in its streets. 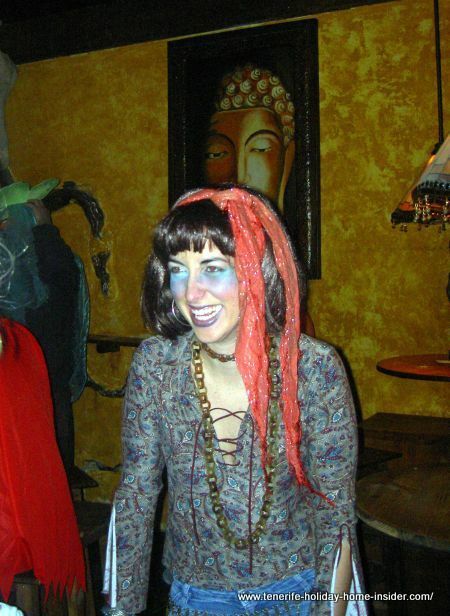 A fashion promotion for the selection of a so called Stradiva is one of its reasons. Also, one of important fashion mottoes is to sell, sell and sell today to make new space for new Spanish fashion tomorrow. Indeed, CC Hotel Mirador del Duque has no Tenerife Zara fashion shop. It doesn't have my latest love of Stradivarius clothes on display either. You have to go to Arona by Playa de las Americas for shopping on holiday. 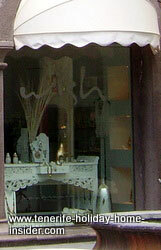 In fact, the most world wide distributed of the eight brands by Inditex may be Zara and Stradivarius, the latter of which are even successful in small fashion conscious and artistic Tenerife towns like the fashion loving Puerto Cruz,, elegant La Orotava and east coast Fañabe, besides Arona and the student town La Laguna as well as the main city of Tenerife. Meantime, the trendiest fashion of Spain for the young would be in the best spot by the almost 10 km long modern pedestrian walk way of Adeje coast which goes past the Hotel Mirador del Duque in the vicinity of many top Tenerife hotels. Use a free virtual photo tour whose topic is much more than about Spanish colonial architecture to see one of best malls attached to the 5 star premises of Hotel Mirador del Duque! 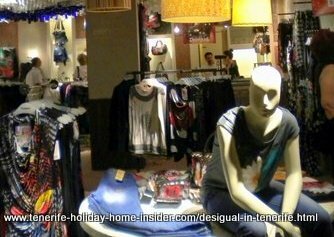 earning scope in the fashion industry for the Tenerife economy when you consider that 4.8 million tourists were counted by February 2011 retrospective for the year 2010, while Euros 3.414 000 000 were spent by them. The latter was reported by a Canary Islands newspaper. To sum it all up again means that a most innovative shopping mall with most fashionable Spanish architecture should also sell most popular fashionable clothes of Spain which the world wants. Mind best new marketing ideas include the promoting of cancer awareness for women and men. Inditex took care of that. But what about the classic business motto by Inditex marketing which is location, location, location, such as in a superb shopping center? 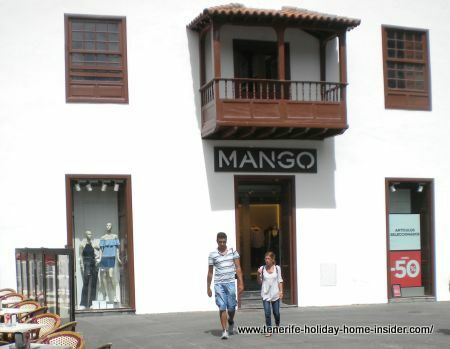 The shopping center of Alcampo La Villa Orotava is certainly taking away a big chunk of Tenerife business regarding Spanish fashion from many little boutiques, stores and retailers in the whole region around Puerto de la Cruz as far as Icod de los Vinos and Tacoronte El Sauzal. By the way, the designers Maria Indeed, the oldest Tenerife resort has its own art community where many have great flair for fashion. Diáz and Marco Marrero from Puerto Cruz are listed to represent Spain fashion Tenerife during the WFW of New York 2013. A Manita Modista at the craftworks fair Pinolere in 2015 was not manned by the designer Carolina Hernandez from Santa Cruz. A charming sales lady represented her. Not to forget is the department store which was named after an English cut. That's the Corte Ingles. Now it has the Spanish nation's biggest department store turnover. 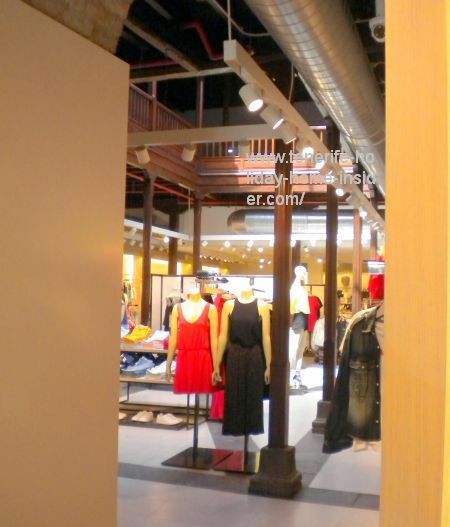 The first and biggest Inditex Tenerife outlet. From Spanish fashion back to shopping in Tenerife.